This is a beautiful wedding story. Both Brandon and Jessica are members of a sister congregation, Holy Cross in Collinsville, Illinois. However, they wanted to be married here in Kimberling City. So this what happened: they received all their marriage counseling and preparation there and I, as a pastor in a sister congregation, married them here. That’s synod at its best! Here is their wedding sermon. In the beginning, God created light and it was good. God made plants to bring forth fruit, and that was good. God made the birds of the air and the fish of the sea, the beasts of the earth, and even the creeping creatures of the ground. God formed man from the dust of the earth and breathed into his nostrils the breath of life. God saw everything that He had made and, indeed, it was good. But if God were a different god, it would have been good for the man to remain alone. If God were a different god, it would have been good for Adam to live a lone existence and not revel in the love of companionship. It would have been good for Adam to live only for himself, fulfilling only his own desires, and only making his face to shine. Adam would have remained bone of his bone and flesh of his flesh, to have and to hold no one but himself, and to his own self be true. But that is not our God. God said, “It is not good for the man to be alone.” For Adam’s creator is none other than the Father of our Lord Jesus Christ. And because God is who He is, Adam is who he is. And because Adam took Eve in His arms, exclaiming, “This one, this time–bones from my bones, flesh from my flesh,” you now, this day, speak solemn vows, a holy covenant to each other. It is not good for the man to be alone. It is good for him to love a wife as deeply as the sinews of life. And the love God calls a husband to have is not something shallow or self-serving. Such love is not only with the heart or lips, but courses so deeply, so fully, that one does not see Adam without his Eve, Brandon without his Jessica. The husband without the wife is as a head without its body, fire without its heat, water without its wetness, the sun without its light. Greater love has no husband than this: that he lay down his life–and live his life–for his wife. Brandon, that is the love to which God calls you, a love that is good and godly, a love that sacrifices for Jessica as Christ sacrifices for His Church. And Jessica, God has called you to receive, cherish, and return such godly love from Brandon. For you are bone of Brandon’s bone and flesh of Brandon’s flesh. You are an Eve to your Adam. Jessica, you are the body to his head. To submit to your husband is to submit to his sacrifice for you, to receive his work for you, to cherish his life and limb given for you. Brandon and Jessica, were your God a different god than the Father of our Lord Jesus Christ, all this would not be. But it is. For God is who He is: God is love. The Father loves the Son and Spirit. The Son loves the Father and Spirit. The Spirit loves the Father and Son. And this is how He loves you: The Father gave His one-and-only Son; and this only Son sends the Spirit; and this Spirit gives you life. The love of the Trinity spills over into creation. And God’s love has spilled over in other ways, too strong for sin and too deep for death to ever sever. For it was not good for Jesus to be alone. So from His side, in the sleep of crucifixion death, God brought forth–not a rib for new life–but the water and the blood of sacrifice with which He built His one, holy, catholic, and apostolic Bride of Christ, the Church. When Jesus, the second Adam, breathed His last, in the sleep of death, a new creation was given life. This creation–the Bride of Christ, the Church–was fashioned from our Savior’s side. She was born from the water and the outpouring blood flowing from our Savior’s spear-pierced side. As Eve was formed from the side of her sleeping Adam, so the Bride of Christ, the Church, was formed from the water and the blood that flowed from the side of Christ on the cross. 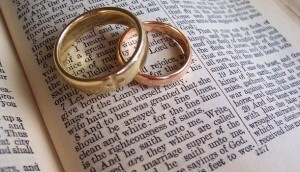 It is that holy marriage–of Jesus to His Church–which makes your marriage what God wants it to be. You are the union of two who have been united to the body of Christ Jesus. Christ wants to have you and hold you both in the one, true faith, and in Christian marriage, and even still from this day forward. For richer, for poorer, in sickness and in health, Jesus will never leave you. He will never abandon you. He has pledged you His faithfulness, sealed in His blood. And although you will not be perfect as husband and wife–for who is sinless on this side of heaven?–Christ’s perfection covers your failures. Jesus keeps you as bone of His bone and flesh of His flesh. And so, although on this day when you both enter the holy bonds of marriage, today is even more the Lord’s day, as every day should be. Today, here, where you gather around God and His Word, we see a picture of how it is between Christ and His Bride, the Church. We see how He declares her holy and forgiven, and how He declares her without spot or wrinkle. Dearest Brandon, be to Jessica as Christ is to His Church. Serve her as Christ serves the Church, giving His all for her. And always present your wife to yourself as someone glorious and beautiful. For she is. She has been washed clean by the Blood of her crucified Lord. Dearest Jessica, be to Brandon as the Church is to Christ. That’s what it means to submit, it means to be on the receiving end of such holy love, and then responding to such love. Jessica, as the Church, Christ’s Bride, receives from Christ, so also receive from Brandon. Let him be as Christ is for you–ready to give his life for you, ready always to shower you with more of God’s love. Let him do everything that he does, for you. And when you both falter and fail, sometimes even before the day will breathe its first, forgive. When one is weak in some small way, sometimes in ways not so small, forgive. As God has forgiven you, forgive each other. When you sin, ask for forgiveness. Then, the one who has been sinned against speaks these Christ-filled words: “I forgive you; I love you.” Then it is done. Then it is finished, as it was at the cross of Christ. God has said, “It is not good for the man to be alone.” And so He has fashioned Jessica for Brandon, and Brandon for Jessica. Joined as you are to the one Christ, members of His one Body, the Church, and joined as husband and wife–this is the good and gracious will of God. May God ever continue to work His will in your marriage, even as He does in heaven. Amen.